An effective treatment for individuals suffering from psoriasis, eczema, leg oedema, and hyper-hydrosis. The Bio-Energising D-Tox Spa System increases feelings of well being that enhance your life. Stress and diet increase toxins into your body that cause an electrical imbalance in your cells. Your feet soak in a large bowl filled with warm salt water. 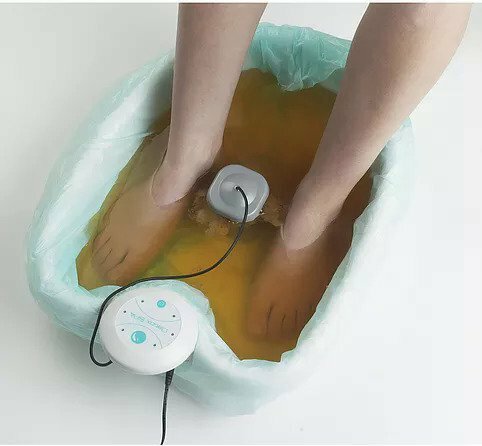 After Placing your feet into the water, the Bio-Energiser then creates “a flow of electrons and bio-energetic field”, which rebalances your “body’s bio-energy”. During your 30 minute treatment session, the water contained in the D-Tox Spa bowl will gradually turn and may foam a little. These are the toxins that are exiting your body. For best results it is recommended that you schedule a series of treatments. Subscribe to Shear Sailing e-news today to receive updates on what is new at our salon, special promotions and offers!